The company itself is structured around owner Cosimo Filane who is a well known recording artist in these parts. He has performed throughout Canada over the past thirty years on telethons, such as the Kinsmen Cystic Fibrosis Telethon, and TV. spotlights. Cosimo is proud to have his family participating in these businesses. Diana, the mother of the crew, is the brains behind the operation and does the books as well as maintaining the motels. Domenic Filane is a 10 time Canadian Boxing Champion (1990 - 1999) in the light fly weight division. He participated in the 1992 Olympics in Barcelona and in the 1996 Olympics in Atlanta. Domenic owns and operates Hollywood Filane Sportswear. He was married in July, 2000 to Kim Rennette and they have two sons, Cosimo Julian (June 2002) and Nicholas Bennett (March 2004). Gerry was also a member of the National Boxing Team in the light weight division. He fought many of the world's top boxers such as Oscar de la Hoya. Gerry worked for the family business for over 12 years, and then accepted a position at Spadoni's GM Car dealership in Terrace Bay. This move lets Gerry be closer to his family. Gerry and his wife, Karen Fournier, married in August 1996, and they have three children, Diana (February 2001), Cosimo (June 2002) and Raoul (October 2005). Karen owns and operates Superior Speech Services, offering speech and language therapy. Edith is the oldest girl, and is third in the chain of Filane kids. She was involved in Figure Skating and was a former coach of the local club. Edith married Dominic Commisso in May, 1992, and they have two boys, Cosimo (September 1996) and Dallan (May 2000). Dean covers Northwestern Ontario selling Filane's Canadian Springwater, and when at home coaches hockey in the minor divisions and is a Director on the board for Hockey North Western Ontario. Salvatore lives in Oakville and distributes water to the greater Toronto area. He is pursuing an acting career and has appeared such commercials as Tostitos, McDonalds and Zellers. He also starred in the movie Crimespree, staring Harvey Kietel and Gerard Depardue. His latest endeavor was a six month acting contract performing about the Disney Cruise Ship, and then an eight month contract playing Franco Defortunato, in Twice Charmed, A Twist on the Cinderella story. Shawn is the designated plant manager of the Water Company in Schreiber, as well as covering the water route east to Toronto. He is also involved in hockey as both a coach and a player. Deana, the second and last girl had taken over the coaching duties of the Schreiber Figure Skating Club for a few years. She skated competitively for years and then passed on all her experiences to the younger members in the club. 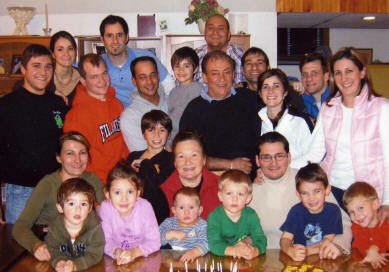 Deana married Philipo Figliomeni in June, 2001, and has one son, Girolamo (June 2004), and are currently awaiting the arrival of a new Figliomeni in November. Youngest of the Filane Boys is Mario-Santino. Mario can be seen filling in in a number of department from in the water plant to pumping gas at the service station. Mario is a full time athlete. He plays for the Northern Hawks, a Junior B hockey team in Thunder Bay. Mario is currently in his 4th year at Lakehead University studying business, and he is hoping to become a lawyer.